Upon hearing that J.J. Abrams and Steven Spielberg were going to collaborate on a movie together, my reaction was the same as million of other movies goers: handsprings and doing the funky chicken victory dance. I figured that with these two creative powerhouses on the same movie, they’d come up with a sure-fire, can’t miss blockbuster. Upon seeing it in the theater, I felt let-down. 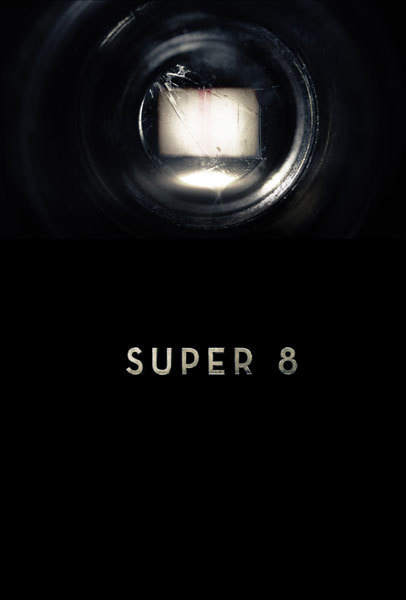 And even now, after having let more time pass since the last time I saw it, SUPER 8 is even more of a let-down. It’s not that it’s a bad movie. Technically it’s a good movie. But the story still doesn’t turn my crank and there are too many things that don’t work for me that stack up higher and higher, forming a wall between me and the movie. It’s 1979 and in the Ohio town of Lillian, a group of kids are spending the summer of that year filming their own movie: a homage to George Romero zombie movies. Joe Lamb (Joel Courtney) is an aspiring make-up artist who has recently lost his mother in a steel mill accident. He’s also lost interest in working on the movie until Charles (Riley Griffiths) the writer/director of the movie talks Alice (Elle Fanning) into joining the cast. Joe has a serious crush on Alice and his interest in the movie is reawakened. It’s during a nighttime shoot that Joe, Charles, Alice and the other kids working on the movie are witness to a horrendous train crash. The next day, The Air Force moves in, quarantining off the town and searching through the personal research of Dr. Woodward (Glynn Turman). Seems as if Dr. Woodward knows what the Air Force is doing in Lillian. And it involves something that was being transported on that train. Something that is now prowling through the town at night, snatching both the townspeople and all manner of electrical devices. 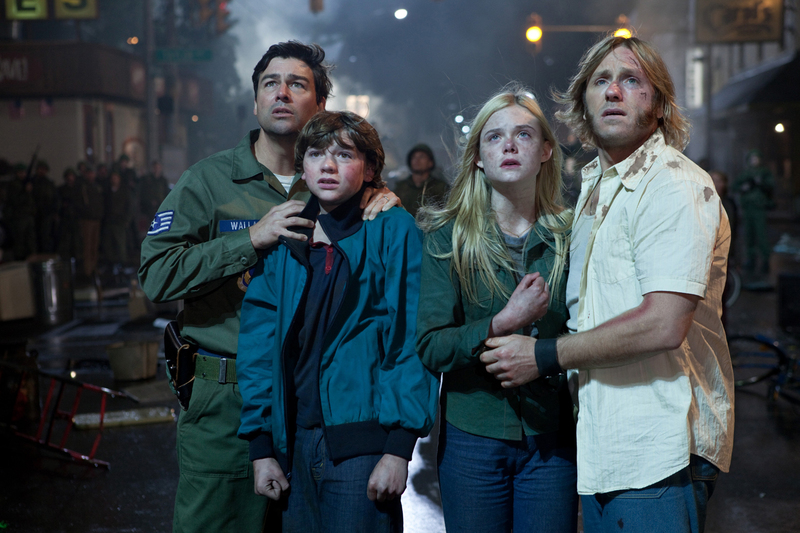 SUPER 8 is described as a homage to the Steven Spielberg movies of the 70’s and 80’s. “E.T.” and “Close Encounters of The Third Kind” in particular. I myself had the feeling I was watching a film made from a Stephen King screenplay written ages ago and maybe found on a shelf somewhere. The Spielberg vibe escaped me totally as Spielberg had a way of getting totally natural performances out of his young actors. None of these kids convinced me they were actually kids living in the late 70’s. With the exception of Elle Fanning who is without a doubt the best actor in the movie, even beating out the adult cast. A lot has already been said about that train crash that kicks off the story. And indeed, it’s perhaps the most frightening train crash I’ve ever seen on film. The problem is that it’s too much. It would be right at home in a “Die Hard” or “Indiana Jones” movie but here it’s just ridiculous in the apocalyptic destruction that destroys an entire train station and what appears to me to be five square miles of countryside while leaving the kids untouched. And that’s only the beginning of a lot of felgercarb we have to swallow if we’re going to buy the monster stuff. And I guess that’s why SUPER 8 doesn’t work for me. There’s a really wonderful coming-of-age-story that could have been told here about Joe and his friends trying to film their little movie while he comes to grips with his mother’s death and his emotional disconnection from his father (Kyle Chandler, who is so bad here he really should give back the check) all while experiencing his first romance with Alice. The problem is the monster movie stuff Abrams insists on shoving in there. A monster movie plot that bored me as there’s nothing special about it at all. So should you see SUPER 8? Let me put it this way: during the end credits, the finished zombie movie the kids have made is shown and I found that more fun and entertaining than SUPER 8. Interesting. Maybe it’s one of those movies you ought to see to find out what’s wrong with it.